Scroll down (doesn't work on a tablet/ipad or phone) and see the flyer with more details. September 22-25, 2018 Fall 2018 - Mid-Atlantic Region of East Coast, Elkton, MD on the Elk River which feeds into CHESAPEAKE BAY - Saturday - Tuesday. Open to all Caregivers; partners, siblings, moms, dads, couples. See on Map here. See Photos and summary of home here. JUNE 1 is EARLY BIRD DEADLINE. Register now and save your spot. ​TREATMENT CENTERS- Ask about our sponsorship benefits, hosting a retreat at your center and complement your parent support without adding more staff! View of the Home we'll be in on the Elkton River which flows into Chesapeake Bay. "Being traumatized for long periods of time you become short sighted. It becomes truly important to sort out how you got to where you currently are, and what it takes to focus on goals to support your child’s recovery." "...Before the retreat I felt helpless, now I feel more powerful! I’m definitely better equipped to help my D after the retreat. I hope I will be able to attend another one! It helped me tone down my anxiety to help my daughter and meeting other moms and sharing our experiences together...priceless..."
"It was EXACTLY what I needed! It was perfect! Thank you!" ​"I learned that I cannot walk this walk for her." Saturday Sept 22 at 4pm -Tuesday Sept 25 at 12pm. See More Photos on the Hope Network, LLC FB Page..
Time with leaders and others who've walked this journey from Saturday - Tuesday. The Eating Disorder not only steals our loved one's lives...it can take away our joy, peace, health, serenity, our groove and our life. 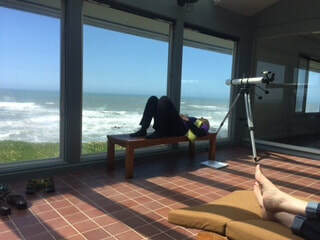 ​If 'ed' has taken too much from you and you'd like to reclaim some of YOU that ed has stolen, see what we do at our retreats and contact us for information about our next retreat. We limit our retreats to keep them intimate and everyone gets lots of personal attention. This one is limited to 8-10 participants. Register now to secure a spot. “Becky, thank you for everything. I loved the retreat. I learned a lot about myself and the exercises you taught us really were helpful. Before the retreat I felt helpless, now I feel more powerful! I’m definitely better equipped to help my D after the retreat. I hope I will be able to attend another one! It helped me tone down my anxiety to help my daughter and meeting other moms and sharing our experiences together...priceless, I feel such a bond with these women. They are all such wonderful people! 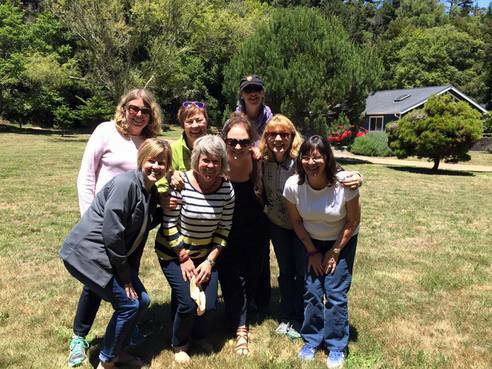 I had more laughs than I've had in years!” - Nancy P.
"The Hope Retreat was a game changer for me. I needed to take a step back from my child, look and actually see what I was going to do that would secure a loving supportive recovery environment for her. Being mindful, in the present and totally appreciating what was both in my control as well as out of it. These lessons provided the key to the recovery kingdom. Now it’s up to me to walk the talk! Escape from the stress, confusion and loneliness of Caregiving for a weekend of hope & renewal. Spaces are limited to join Certified Professional Co-Active Coach Becky Henry who brings rays of light and hope to your journey. Time with leaders and others who've walked this journey from 4 pm Saturday - noon Tuesday. REGISTRATION OPEN NOW! You can contact us now to reserve a spot. What's holding you back? "time", "money" etc? Here is what we want you to know. There is healing value in stories, those who want will share stories. We will play. Think of it this way, you have been through a lot and you're still standing. That's something worth celebrating! We will celebrate, we will shift perspectives to be able to reclaim that playfulness, as well as JOY and HAPPINESS! if you’d like to talk more, call Becky and talk about it. You don't want to miss this opportunity to reconnect with YOU! And connect with moms who GET IT. There will be time for KAYAKING, BOATING, RELAXING ON THE DECK, NAPPING, READING, WRITING, DANCING, WALKING, PLAYING, LAUGHING. All bookings are final. But you can transfer your spot to someone else. TREATMENT CENTERS: Contact Becky about providing sponsorships and/or hosting a retreat for your families without adding more staff! See our current sponsors below. Still not sure you're ready to take the leap and sign up to reduce your isolation? If you are still undecided, here is more information about us. Please contact me and set up a time to talk. There is no pressure, we want to make sure this is the right fit for you. National Award-winning author, Becky Henry, CPCC, ACC President of HOPE Network LLC and Infinite Hope Publishing is a Certified Professional Coach and international speaker. 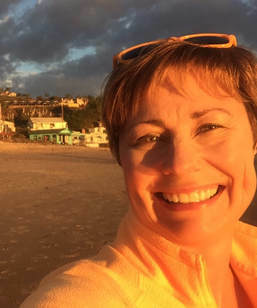 As an unwilling expert, Becky found a process to reclaim joy, she provides support and coaches eating disorders caregivers through this process. 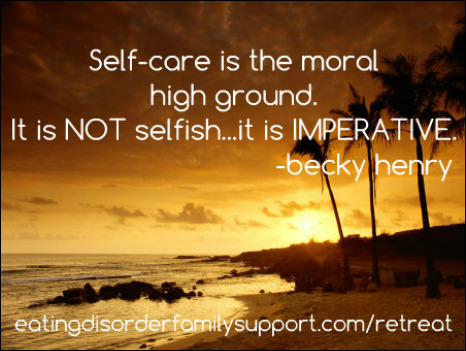 Becky's vision is to see health care organizations fully include families in eating disorders research and treatment. 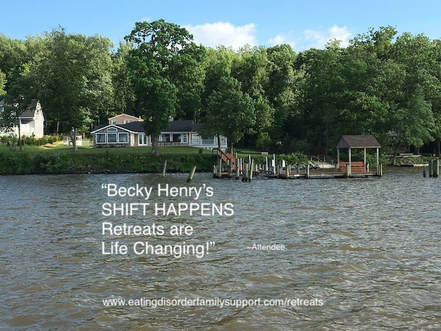 Kitty Westin - Co-Facilitated June 2015 Retreat & Couples Retreat in MN October 2016 with Becky, Thea & Joe Kelly. Kitty Westin is the founder and former President of the Anna Westin Foundation which is now known as The Emily Program Foundation. The Anna Westin Foundation was started by Anna’s family after Anna died of anorexia in 2000. 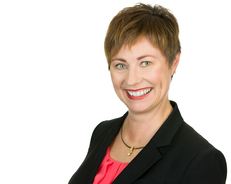 Kitty is on the board of The Emily Program Foundation, the Eating Disorders Coalition for Research, Policy & Action, and she is a member of the Minnesota Governors Advisory Counsel on Mental Heath, the Minnesota Mental Health Legislative Network and numerous other boards and counsels. Since Anna’s death Kitty has spoken to millions of people about eating disorders through personal appearances and the media. She has been invited to tell her story to a variety of groups in Minnesota and across the United States and the world. Kitty has been an outspoken advocate for people who struggle with eating disorders, their families and friends, and professionals who work in the field. Kitty has received numerous awards for her advocacy efforts including the EDC Advocacy Award, the Redbook Mothers and Shakers Award, the AED Meehan/Hartley Leadership Award for Public Service and/or Advocacy, the Park Nicollet Community Service Award and the National Eating Disorders Association Inspiration Award. On Becky’s Services: see more by clicking here! programs: Monte Nido and Oliver-Pyatt Centers, which provides residential treatment to women, and outpatient treatment for males and females; and Clementine for adolescent girls. We began offering residential treatment in 1996 having been founded by women who are fully recovered and became leaders in the eating disorder treatment field. industry leaders and share the belief that fully recovery is possible. Additionally all of our residential programs are in home-like settings, providing an environment conducive to healing. The Healthy Teen Project provides Intensive Outpatient and Partial Hospitalization programs for teenagers who struggle with eating disorders. Through our multidisciplinary approach, we address physical, emotional, and nutritional health, academic functioning, and family and peer relationships. Our goal is to provide holistic care that supports adolescents and their families in finding new and healthy ways of living. Family Support - With teens, family support and therapy is an integral component, both for nutritional rehabilitation and to explore other challenges of adolescence and mental health. Group Therapy And Support From Their Peers - Group therapy allows teenagers to find a place where they can open up and be honest and real about their struggles, relate to others, and receive much needed support. Teenagers are at very different places in life than adults and it is other teenagers that provide the validation and support they require. Greater focus on behavioral and experiential opportunities vs. cognitive/verbal skills -Teenagers get more out of "doing" rather than "talking about doing". At HTP, teenagers are actively engaged in experiential opportunities and behavioral approaches, such as art therapy, yoga therapy, meal preparation and restaurant exposures. Additionally, HTP provides a teen-oriented environment where teens can feel safe, nurtured and hopeful. By not treating adolescents along side adult peers, HTP is able to provide the interventions specific to teens with eating disorders. Our multidisciplinary team consists of professionals with medical, psychiatric, therapy and nutritional backgrounds. 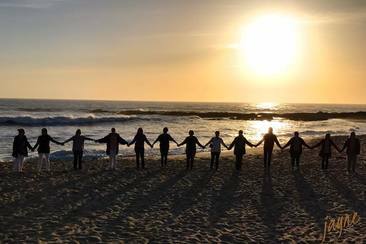 Together our team has over 75 years of treating eating disorder patients across a range of environments including: in-patient medical and psychiatric hospitalization, residential treatment centers, partial hospitalization and intensive outpatient programs, as well as outpatient clinics. 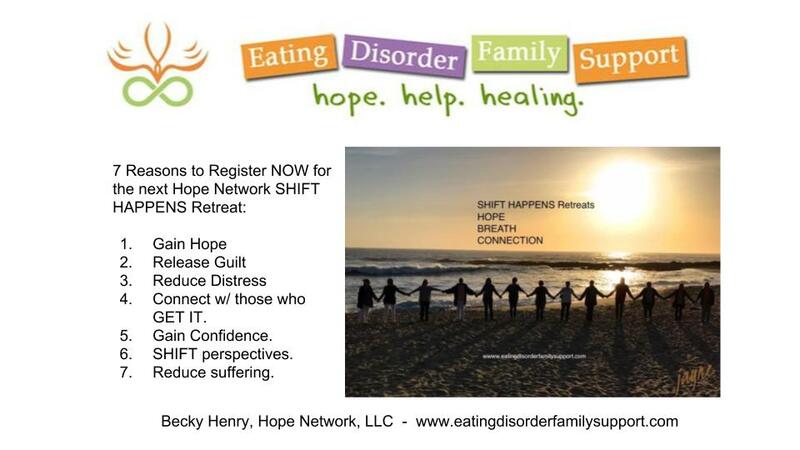 When and where have "Shift Happens" Retreats been held you ask? You can see more photos on the Hope Network, LLC Facebook page.